Visiting City of London and looking for a location to swim? Nice choice! Don't neglect to tell us how did it go. 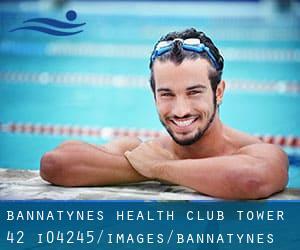 Introducing now Bannatyne's Health Club - Tower 42 swimming pool, an incredible swimming pool sent by a swimmer like you few days ago. Have you visit this pool? Do you work here? Please, contact us when you have knowledge that you believe is gonna be useful and recall from now on you can actually now promote every pool just by sharing this page with your close friends or adding comments within the Facebook boxes below. Come on and support this pool to be the first in City of London! Among all the activities offered by the centre, if you are interested in swimming you will appreciate 20 meters x 6 meters, Indoors. Just in case you wish to contact this Swimming Pool just before dropping by, we only know the phone number. Write down the GPS coordinates we have on our file for this Aquatic Centre, so you can enter them into your GPS to assist you locate the Pool easily. We strongly recommend calling before visiting the Aquatic Centre. If you believe that any on the info is incorrect, please contact us. Enable us be better day-by-day. One Ropemaker Street , The City , London - Central , England , UNITED KINGDOM (Postal Code: EC2Y 9AW). Swimmers like you reported 20 meters x 10 meters, 4 lanes, Indoors. Unfortunately we do not have the email address of this Pool, but we can provide you with the phone number. Ibex House , 1 Haydon Street , The City , London - Central , England , UNITED KINGDOM (Postal Code: EC3N 1HP). This sports centre delivers 18 meters x 10 meters, Indoors. For this Pool, only phone number is number here. Cousin Lane , The City , London - Central , England , UNITED KINGDOM (Postal Code: EC4R 3XJ). This sports centre offers 18 meters x 6 meters, 3 lanes, Indoors. For this Pool, only phone number is number here.